During the time Shine was released Starbucks produced the Joni Mitchell daily trivia calender. On October 5, 2007, I walked into a Starbucks and saw the daily calendar sitting on the counter. The calender was 2 days behind so they let me take the two dated pages. The manager at this store said that these daily calendars were only released at certain Starbucks and for use by the store. Shamelessly, I begged to purchase it, but to no avail. I went looking for calendars at 4 other Starbucks and they didn't have them on the counters. The managers I talked with had no idea what I was talking about. At one store, the manager was kind enough to dig in her back room to see if she had missed the calendar coming in with deliveries. But she found nothing. 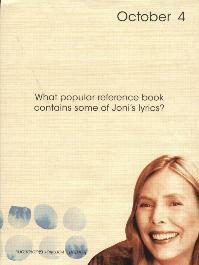 What popular reference book contains some of Joni's Lyrics? When does Joni do most of her creative work? Notice the answer to the trivia questions are upside down on the bottom of the page. If you have any information on these calendars, please let us know!